Softcover - 576 pages. Dover Publications - 1982 (republication of the second edition, 1935). In this classic manual - "for its time the most comprehensive treatment of the subject" (New Grove Dictionary of Music and Musicians) - a noted English composer describes 57 orchestral instruments (ca. 1914), tracing their origins, development and status at the beginning of World War I. Not only are the history and evolution of each instrument fully discussed, the author also explores the techniques of each instrument, as well as players' impressions about what they must play. The result is an unparalleled insight into the inner workings of an orchestra - a vivid impression of what it is like to be a violinist, clarinetist, trombonist, or other orchestral player. 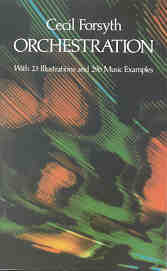 While there have been numerous developments in instrumental technique on an individual basis since the book's first publication, most of what Forsyth says is still valid. Writing with wit, grace and good sense, Forsyth created a formidably thorough, comprehensive and informative text that has instructed and influenced generations of composers, conductors, musicians and musicologists. Our price: $16.95 + $10 shipping for first item, others $6 each.